It was with great pleasure that I represented Scotland at chess for the first time as part of the Scotland 2 Team at the World Seniors Championships at Dresden, held earlier this year. There were several tournaments, the over 65s, the over 50s and a womens over 50’s. The women’s teams played with all the other over 50’s teams as a tournament within a tournament. The Russians won the over 65s convincingly with ageing GMs on all boards who were part of the Russian elite during the Fischer Spassky era. The strongest team in the over 50’s was England with Short, Nunn, Speelman and Arkell. Scotland’s first team comprised Colin McNab, Steven Mannion, Roddy Mackay and Douglas Bryson. Both England 1 and Scotland 1 lost to Slovakia however, who emerged as the tournament winners. Scotland 1 were finally paired against England 1 in the last round, effectively playing off for the Bronze position, but Scotland lost heavily in the end alas. The Scotland 2 team is pictured below at dinner in the hotel. 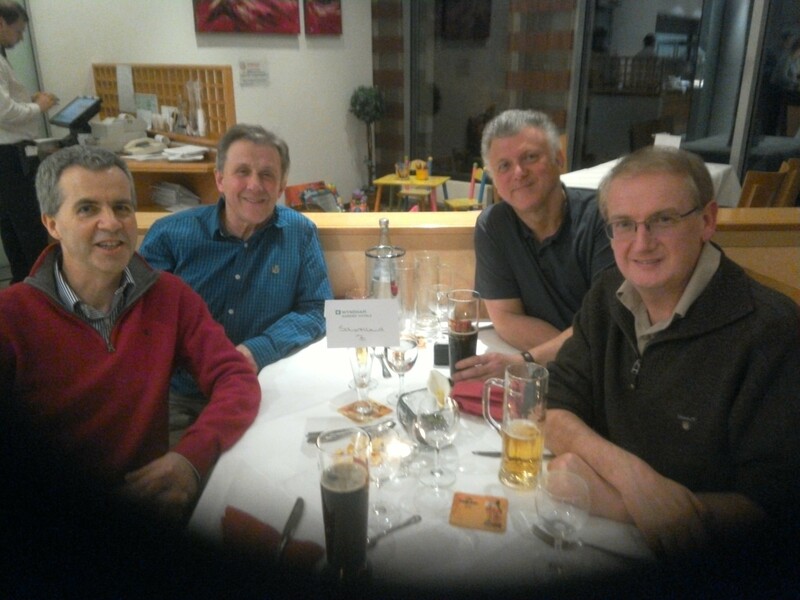 From left, myself (Board 4), Alastair Dawson (Board 3), Alan Scrimgour (Board 2 and Captain) and Jim Stevenson (Board 1). The event took place over 9 rounds with 1 round per day and Scotland 2 finished 29th out of 45 teams, which was better than our ranking of 36th. We won 3 matches, lost 4 and drew 2. Inevitably there were a few points that got away and my feeling is that we could have done even better if we had not spoilt a few positions. My final score was 5/9 and our captain performed heroically on Board 2 with 6.5/9 and the others each scored 3/9. In Round 1 we were paired against a strong team from Leipzig. My game went very well and I beat a 2100+ player in a very smooth game. My opponent played passively waiting for me to make a mistake I suspect and we reached the position below. As Black I could not resist playing Bc5 + which was not a bad move, but the computer prefers pushing the h-pawn. 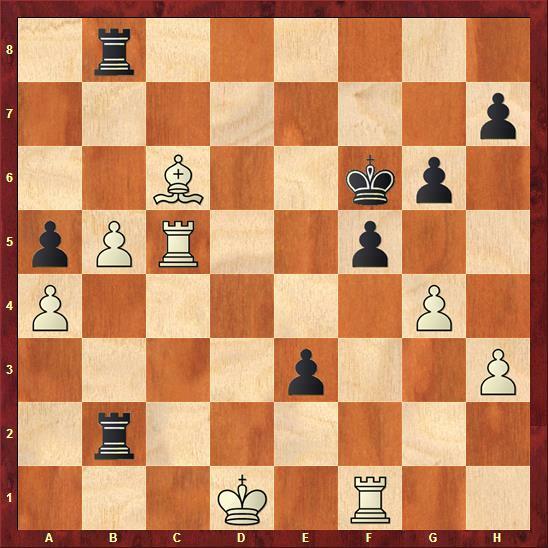 Still, I invaded on the dark squares around White’s king and reached a won endgame. Just before the time control I had less than 1 minute for the last 2 moves and almost went pawn grabbing, but just hesitated and to my delight noticed that I actually had a forced mate, which I played. Nice one! The match ended 2-2, so we were off to a good start and paired against another strong team with a 2100 on bottom board. In Round 2 we took a bit a beating and lost the match. On Move 18 I played Rf1-d1. You know it must be a poor move when Fritz says the best subsequent move is to return the Rook to f1! This was indeed an important point, where the position tipped from being pleasant to unpleasant for me. Still it was not lost. Fritz suggests 18. a4 as shown in the position below. 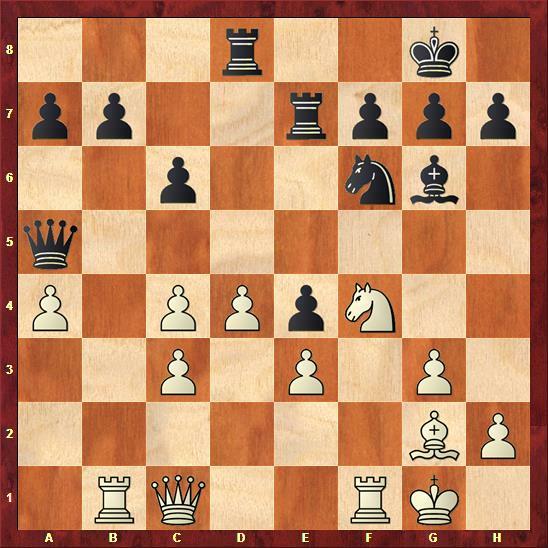 If the Queen captures the a-pawn then she will struggle to retreat after White plays 19. Rf2. 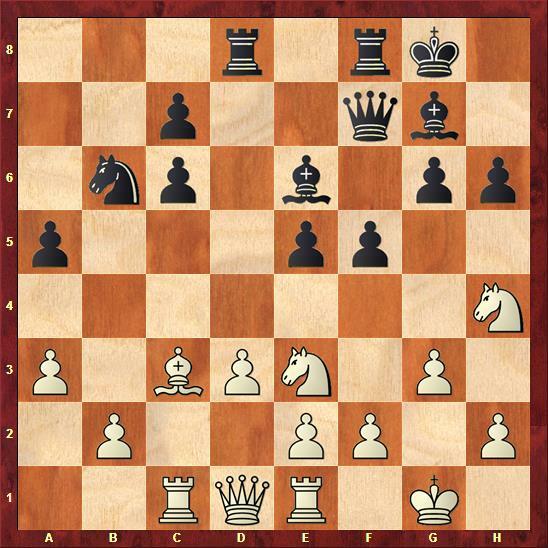 For example, if the Queen captures the pawn on c4, she will not have any retreat squares after 20. Bf1 Qa4, 21. Ra1 Qb3, 22. Rb2. 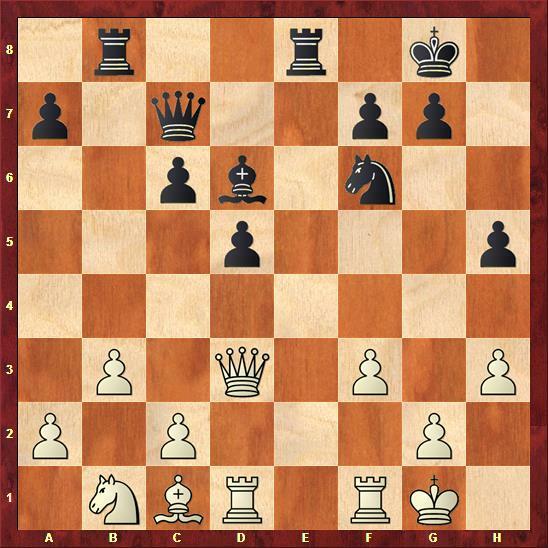 Pity I did not play this as I had seen the idea, but thought it better to play for the pawn push in the centre. After a couple more positional errors Black was firmly in control and won a good game. It is often said that players need to study their losses in order to improve, which I concur with for this game. In Round 3 Scotland 2 played German Women 2. I played a good game and won a piece for a pawn and the position with White to play is shown below. Sadly I played 43. Re1, whereas 43. Ke1 would have left Black with no more counterplay. After another couple of inaccuracies the position ended up such that I could not avoid perpetual check or material loss and so the game was drawn. Disappointing, but Scotland 2 won the match at least. In Round 4 Scotland 2 played Belgium 2. After a very successful opening as Black I chose the wrong plan and lost. Another game to learn from unfortunately. The team lost too. In Round 5 versus Sweden 1 I came out of the Opening with an uncomfortable position. This was the only Round in which my opening was poor, so my pre-tournament Opening preparation seems to have been good enough. Still I needed to have a long think about how best to proceed. And White went on to win owing to the shattered pawns on Black’s Queenside. A very successful plan in a dodgy position and my opponent told me after the match that he had assumed the Bishop capture on c6 would be fatal for White. He had not seen the effectiveness of the f4 pawn-ram! We lost the match however, but at least I was back to winning form after a string of disappointing results. In Round 6 we played another German team from Berlin and the match was tied at 2-2. I lost after having a good position. The game should have been drawn, but I perhaps pressed too hard as I was a bit better and blundered. This was poor team play as my opponent had offered me a draw which would have been sufficient for Scotland 2 to win the match. Oh dear. Still, the team forgave me I think, but not my finest moment of the tournament. Positions from my games of Rounds 7-9 form the basis of an article submitted to Chess Scotland for publication in their magazine. So I will not give away the plot here and encourage you to look out for this article. All the members of Scotland 2 have contributed to this article and I found the quality of the games and analysis to be very good. Suffice to say that I finished strongly with 2.5/3 and my wins in Rounds 7 and 8 both involved material sacrifices for the initiative, and both paid off. I was strictly forbidden to take pictures with my Tablet device as I was a player and my Tablet has chess software installed. Still I asked nicely again in the last round after my game had finished and took a few pictures in the playing hall. Next year’s event will be at another location just outside Dresden in the wine growing area. I suspect the venue can accommodate more teams because the organisers were overwhelmed by the number of entries and had to limit the event to 88 teams. The Scotland 2 team have expressed a desire to repeat this event in 2016. We shall see.